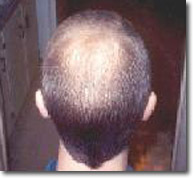 Greg has had incredible success with Propecia and Minoxdil (rogaine). Check out his Before and After pictures here. When did you start losing your hair? Did you do anything immediately? Yes for about 4 to 5 months. I started Rogaine when it was expensive, and it was the 2% form. And I had to see a doctor to get a prescription. I continued balding, so I stopped. Kept my hair real short and wore lots of hats. How long did you wait before you took action? I have just started really doing something about the hair loss. Since December of 99, I have been using Finasteride (Propecia/Proscar) and Minoxidil (rogaine) everyday, and for me, it has made a big difference. Please keep in mind that this is what works for me. It may not work for you. As a matter of fact, I have read testimonials of people who have had worse hair loss using the exact same thing. So please see your doctor before trying anything. What are you currently doing about your hair loss? I take Finasteride - 1.25mg once a day (Proscar tablets quartered). 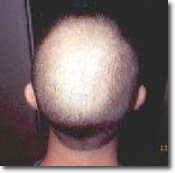 Propecia comes as a 1mg dosage, but I get the Proscar 5mg dosage because it is cheaper in the long run to quarter the pills and my doctor said it was OK to do this. I'm also using Minoxidil - 1ml of the 5% twice a day. This medication come in two strengths. 2% and 5%. For me the 5% works much better. Lastly, I'm using a good dandruff shampoo because the Minoxidil (Rogaine) will dry out your scalp. I rotate between Nizoral and T-Gel. 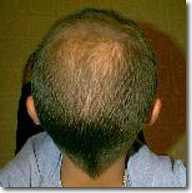 (TGel and Nizoral type shampoo's were used in the Propecia trials). How long have you been on your current regimen? For me, after the 3rd month, I started noticing small, very fine black hairs on my temple area where my hairline used to be. These hairs got darker and longer as the rest of my hair. My crown area also started filling in. My hair loss was slowing down very rapidly. But expect thinning phases. I experience lots of off and on thinning. Sometimes the shedding is so bad I think I am going in the opposite direction but it soon stops and I regrow everything I lost back. Then it comes back thicker and darker. It is a roller coaster ride. One thing I did notice though, while taking a men's daily multivitamin my shedding phases would be worse and last longer. Now that I stopped taking them my thinning phases are shorter and not as bad. I really don't think that I will regrow all my hair back, but compared to where I started, I am very pleased. It has been well worth the effort. The best advice I can give is try not to get too hung up on it. Take it slow and don't look in the mirror everyday and don't count hairs in the sink. Hang in there and good luck. Get all your hairloss products online at HairlossSucks.com! Rogaine for Men and Women! Revivogen, Folligen, Crinagen, & all Tricomin Products as well.